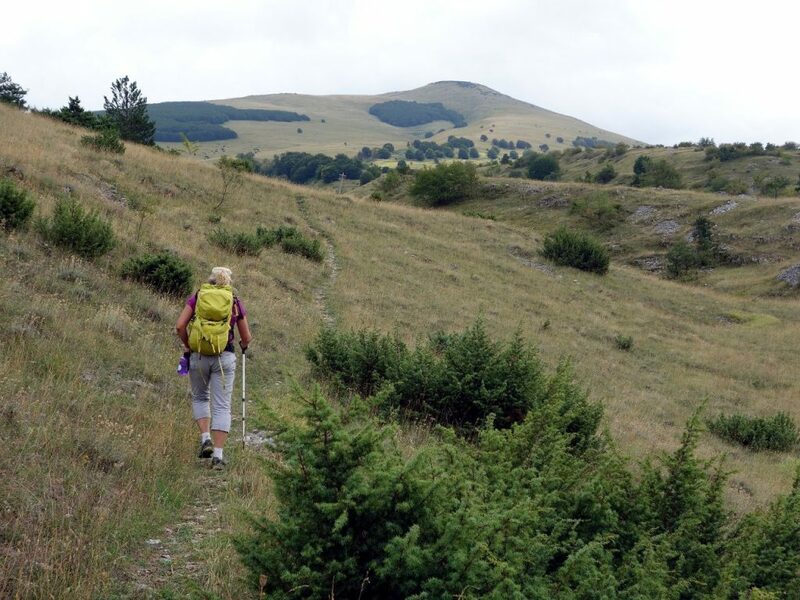 I haven’t talked much about Maiella, the high tableland on the eastern side of the Apennines in central Italy. But recently I read a book about it that brought back a few memories. I made three visits there with Edita to climb Monte Amaro and its surrounding peaks from various directions. Maiella is dominated by Monte Amaro and its adjacent peaks and ridges, which form a network of plateaus over 2,500m in height. 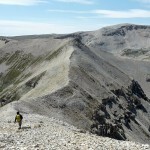 The plateau itself is like the surface of the moon – grey, rocky, and mostly devoid of life. But down in the valleys, the land is a paradise on earth with forests, wildlife and water in abundance. 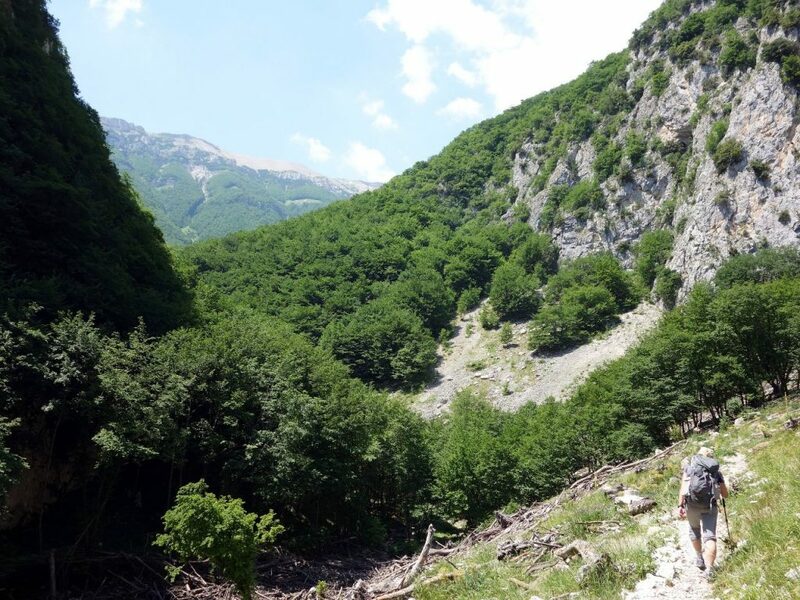 Many of the valleys are thickly wooded gorges and one of these, the Orfento Valley, is the focus of this post. We completed a circuit of the Orfento Valley on my first visit to Maiella. Thunderstorms were forecast in the morning, so we decided on a short afternoon walk to explore the area, rather than climbing a mountain. 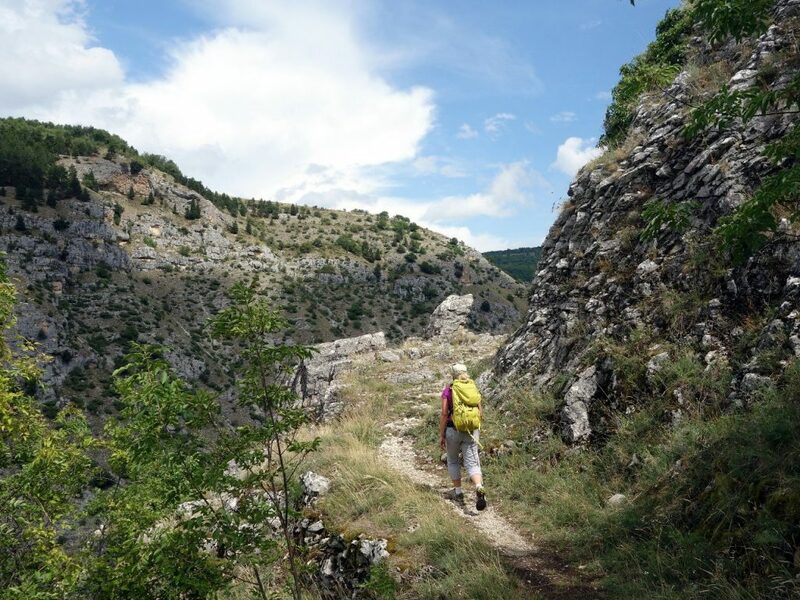 We hiked up the southern rim of the Orfento Valley into a high pastureland above, had lunch at a picnic spot in the forest, before descending along the floor of the gorge to the town of Caramanico Terme, a quiet resort of hot springs. At the lower end of the valley were a series of grottos hewn into the rock of the gorge, and it felt like a landscape from Lord of the Rings. On that walk, Edita told me about her first memorable visit to Maiella with a friend a few weeks earlier. She stayed at a guesthouse in the village of Decontra, high on the rim of the Orfento Valley. 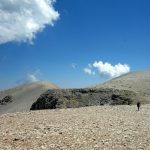 Upon learning that they intended to climb Monte Amaro, the landlady of the guesthouse gave them a small bag and asked them to collect a few pine cones that grew at some of the lesser altitudes on the flanks of the mountain. The pine-cone resin was used to make a local liqueur. Some of you can probably guess where this story is heading, but before we get to that point, Edita and her friend had another fright to endure. 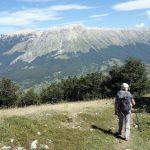 September is stormy season in the Apennines, and somewhere on the woody ridge between the peak of Blockhaus and the higher reaches of the Maiella plateau, they found themselves in the midst of an almighty thunderstorm. Rain came down in sheets and the sky flashed like a violent Pink Floyd concert. The storm was so close that they could feel the bolts of lightning as they struck the ground around them. The ridge beyond Blockhaus on the trail from La Maielletta, with the plateau up ahead. Here Edita encountered a fearsome thunderstorm. They were lucky to survive this ordeal, and they were soaked to the bone and bedraggled as they beat a retreat back along the ridge. But Italian storms can be over before you have time to say ‘Gianluigi Buffon’, and as they were skirting below the summit of Blockhaus, the sun had emerged and the sky was clear again. That part of the trail was flank by thickets of pine bush, and they remembered their landlady’s request to harvest a few pine cones. Despite the inclement weather, they were not alone on the mountain. Maiella is a national park, and unbeknown to Edita and her friend, their landlady had asked them to perform an illegal act. It’s OK to pick up a few dead cones that have fallen naturally, but you’re not allowed to pick live ones like apples. Moreover, it appeared to be an act that is often done less innocently. They were seen by a passer-by who did not approve. But rather than having a quiet word with Edita and her friend, this person decided to report the incident to the police. By the time Edita reached the end of the road above La Maielleta, there was a police car waiting. They were caught red-handed with a small bag of contraband. It took all of their diplomatic skills to convince the officers not to arrest them. They’d had no idea they were breaking the law, and thought they were being helpful to their friendly landlady. The landlady was less friendly when they returned to the guesthouse. She had received a phone call from the boys in blue, and wasn’t keen to acknowledge her hand in the affair. This is not a guesthouse or a village they will be returning to, but there was one consolation. 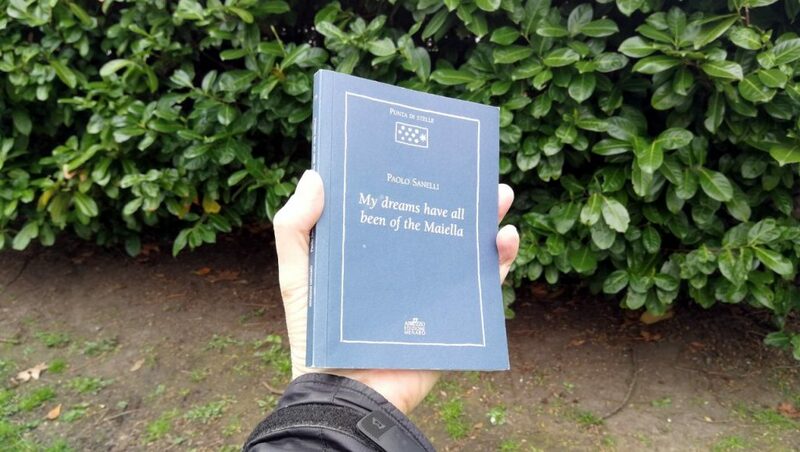 Edita was given a book, My dreams have all been of the Maiella by Paolo Sanelli. I found this book on our bookshelf the other day. It was only a pocket-sized 100 pages, so I decided to read it there and then. To date, I have found very few books about the Apennines written in English, and this was one of those rare books in Italian that have been translated into English. Paolo Sanelli – or Paolino, as he is known throughout the book – was a shepherd from Decontra who farmed and tended his flocks in the mountains around the Orfento Valley over a period of about 50 years in the middle part of the 20th century. His memories of a shepherd’s life were collected by a journalist called Marco Manilla, and My dreams have all been of the Maiella is the book that arose from that collaboration. 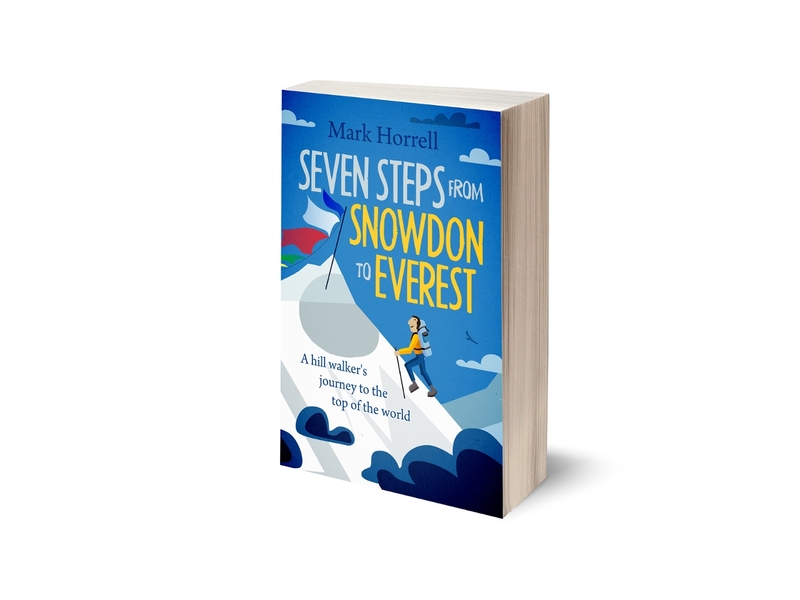 It’s a record of a vanished time, and is full of quirky stories about a life in the mountains of Maiella. These include the story about the only educated man in the village, who received his education in prison for what Paolino described as ‘some bad luck’. After his release, the villagers asked him to set up a school. He agreed, and became the teacher for a generation of village children. Paolino described visits with their sheep to the summer flocking grounds on Piana Grande, a high plain above the Orfento Valley where the climate was more temperate. It was work they enjoyed. ‘No one thought about work,’ Paolino said, ‘even though the work was hard’. The ploughing was particularly strenuous because the ground was stony. He described how he lost all his cows after a series of misfortunes. The last surviving cow was struck by a rock dislodged by a herd of goats (possibly chamois or camosci). There are stories of making cheese using a pig’s stomach, of how there used to be hundreds of wolves roaming in Maiella until the land was sold to charcoal burners in the 1930s and the wolves were persecuted. I enjoyed reading it. Although the nostalgia was lost on me, certain passages in the book reminded me of my own visits to Maiella. It wasn’t only our short walk up and down the deep, wooded ravine of the Orfento Valley. Rising above the top end of the valley is the peak of Blockhaus, a rounded, woody plateau which is little more than a bump on Maiella’s northern ridge, the main standard route to Monte Amaro above the ski resort of La Maielletta. We diverted around it the first time we climbed Monte Amaro, not realising that at 2,142m it is one of the Apennine 2,000ers. When we climbed Blockhaus two years later, we couldn’t find an established trail, and became separated trying to find a way through the maze of pine thickets that shield its flanks. We met up again at the ruined building on the summit from which the mountain derives its unusual name. In the 19th century Austrian troops were garrisoned there to fight bandits. Bump on the ridge it might be, but to Paulino, Blockhaus was known as ‘the mountain’ because of its proximity to the Orfento Valley. He makes no mention of ever venturing higher, up to the moonlike plateaus of Monte Amaro. It would not surprise me to learn that he never did. Nor did he ever write about making journeys for leisure. Travelling was only done for a purpose, usually for work. He spent a summer in Britain, picking fruit in Essex. He hated it because it rained nearly every day. 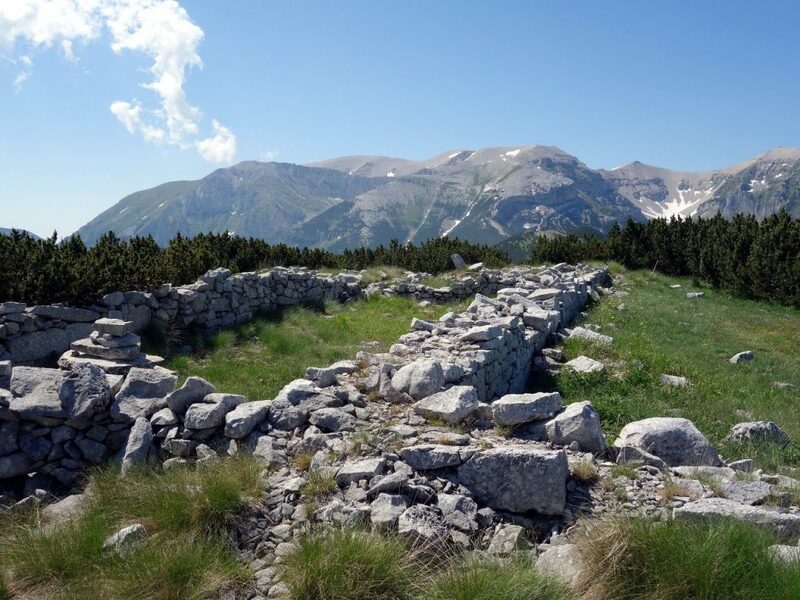 For two summers during the war, the people of Decontra crossed ‘the mountain’ Blockhaus to trade cows for sheep. There was a drought. In Decontra they couldn’t make hay because all the grass was yellow and dry. Meanwhile, over in Fara on the east side of Maiella, the grass was green but the German Army was stationed there, and they had killed all the cows to eat. So the people of Decontra reached an agreement with the people of Fara. They took their cows over to Fara to work the land and feed them on the lush grass. Edita and I once stayed a night at a guesthouse in Fara after making an abortive attempt to reach the Maiella plateau from the eastern side. 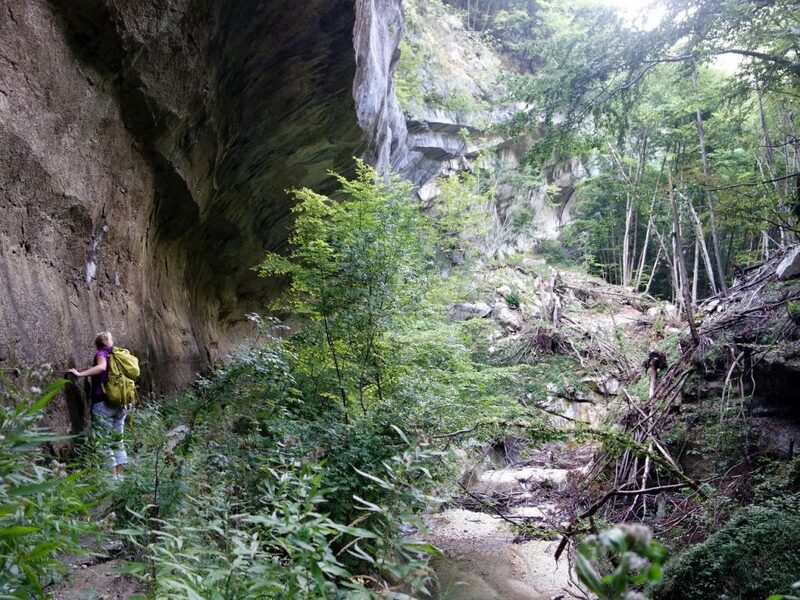 Fara nestles beneath the secret entrance to the San Spirito gorge at a balmy altitude of 400m. 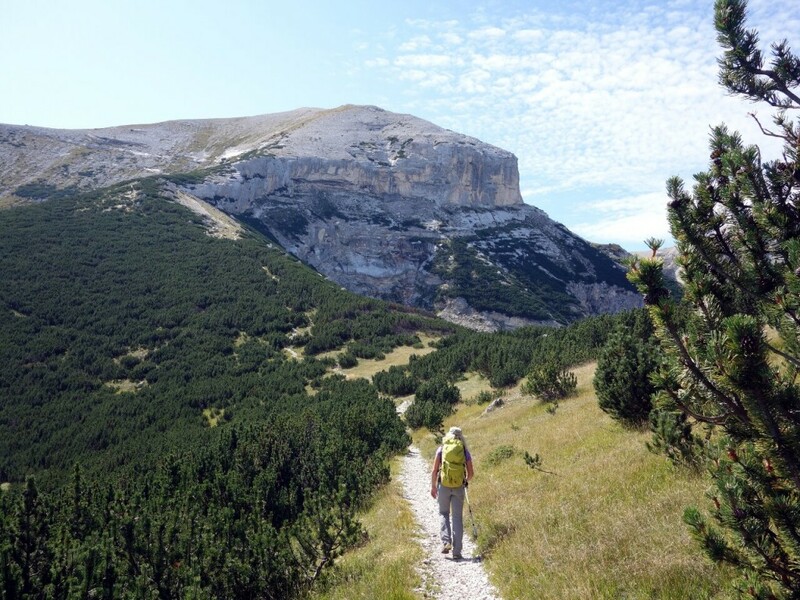 Our plan to reach the summit of 2,737m Monte Acquaviva from Fara in a single day was bullish. We managed barely half that height, but were turned back unexpectedly by a tangle of the same prickly pine bushes that had caused us problems on Blockhaus. They spanned the entire width of the ridge that we wanted to climb. If they could grow this stuff along the Texas-Mexico border then it would be far more effective than any structure Trump is thinking of erecting. There was no way through, but our excursion was far from being a disappointment. The entrance to the San Spirito gorge was barely more than two metres wide but the cliffs on each side rose like battleships. Once through this secret entrance, the valley on the other side was like a hidden kingdom: a rock climber’s playground, carpeted by thick forest. The parallel valley (the Val Serviera) to its north was no less impressive. We traversed a narrow path hewn into rock high above the valley floor, and it felt like a Himalayan trail. Paulino’s story also reminded me of my favourite book about the Apennines. Admittedly, there isn’t much competition for this prize (or I’ve yet to find it) but this particular book would feature on many people’s list of the best travel books ever written – I’m talking about Eric Newby’s Love and War in the Apennines. Newby escaped from a German prison camp in Italy during the Second World War, and spent several months hiding in the Apennines with the help of locals. The Orfento Valley is riven with caves like a Swiss cheese and has been home to hermits and pilgrims throughout the centuries. Many escaped prisoners and partisans hid in these caves during the war, and when the Germans came to find them, the locals helped them to escape from Maiella. The nostalgia and the memories of Maiella may be unfamiliar to some of you, but Paulino’s book is also full of universal themes. His chronicler Marco described the serenity Paulino derived from simple tasks. If he makes bread, he makes only bread and doesn’t think of anything else; quite the opposite of stressful modern life where everyone is rushing and always wanting to be somewhere else. This is a great example of living in the moment, a skill many of us spend a long time trying to master. Marco also talks about Paulino’s ‘love for nature which predates environmentalism’. But I know many people who love the outdoors and still have that love for nature. Their environmentalism is a result of their love for the outdoors and not separate from it. It was fine in those days to arrive in another village or another place on foot; it was like a journey and a fine adventure: you didn’t think about being tired, you walked and looked at the lovely magic of the landscape. If you’re a regular reader of this blog, then you may well be like me, and you will be nodding your head as you read that sentence. It’s something we can well relate to, and hopefully for the rest of our days. I keep thinking that sort of life was way better than the life we live nowadays.